SodaStream One Touch has an average rating of 3.4 out of 5 based on 5 user reviews. The SodaStream One Touch has three levels of carbonation you can achieve with the push of one button. The machine creates the carbonation with co2, which comes in a cylinder you screw into the back of the unit. The slim and sleek design sits on the counter and uses the electric wall plug for power. 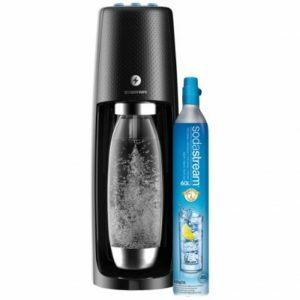 The SodaStream One Touch will make 1 liter of carbonated water, which you store in the BPA-free plastic and stainless bottle provided. What makes it better than other drink carbonators? The features on the SodaStream One Touch make it easier to operate than other models of carbonators. The electric unit does all the work for you, with consistent results every time. Other models are manual, where you need to push the carbonation button several times to get results that were never the same. The design is sharp. The One Touch is slim, with a high gloss finish on the plastic components. The texture embedded in the top section adds flair. First-time use: Open back cover, insert carbonation canister up through the bottom and screw fully into place. Close back. The canister will work for up to 60 liters, so this step is infrequent. Fill the provided bottle with water to level indicated. Tilt the bottle and slip the white nozzle inside the neck. Push bottle in till it snaps and locks. Push one of the three carbonation preset buttons on the top of the unit. Wait for carbonation process to stop. Remove bottle from unit and screw on cap. The nozzle swivels out, providing the perfect angle for inserting and removing the bottle from the unit. On top of the One Touch are three buttons that light during carbonation. The machine automatically carbonates your water to three levels of fizz. When the light goes out, you can safely remove the bottle. The plastic unit measures 5″ x 7 1/4″ x 17″ and comes in black or white. Shipping weight is 10.2 pounds. The unit’s slim design looks great on the counter, so you can make sparkling water in moments. The electrical-powered unit creates consistent levels of carbonation every time. The snap-lock technology when inserting the bottle ensures proper fit. CO2 canister creates fizz in up to 60 liters of water. SodaStream has an exchange program for used canisters, reducing waste. BPA-free plastic bottles will not leach harmful chemicals into your water. The bottles are reusable, saving money and keeping waste from regular bottles and cans out of landfills. Carbonation level pre-set buttons take the guesswork out of creating your desired fizz level. How do I wash the BPA-free bottles and how long do they last? The plastic bottles are hand wash only. SodaStream recommends discarding bottles on the expiration date printed on the bottle. Can I carbonate liquid other than water? No. The One Touch is made to only carbonate water. Trying other liquids may be dangerous and could ruin your SodaStream. Yes, the best part of owning a SodaStream One Touch is the time and money you can save by turning your tap water into sparkling water. I recommend keeping a jug of water in the refrigerator to use in the unit. Cold water holds carbonation better. How can I flavor my sparkling water? SodaStream offers a variety of flavor packets to add in after you have completed carbonation. You can also add fresh slices of fruit. Wipe the outside of the unit with a damp cloth. Do not submerge in water or put in the dishwasher. Can I use bottles from other SodaStream machines? The One Touch model is compatible with all SodaStream carbonation bottles. Where can I get CO2 replacement canisters and other supplies? Order replacement canisters, flavor packets and extra bottles from the SodaStream website, or visit one of over 12,000 retail locations nationwide that carry SodaStream products and replacement supplies. I found myself impressed with the electric-powered SodaStream One Touch. The consistency of the carbonation level achieved is reason alone to purchase. I really like the ease of use with the one-button operation and knowing the bottle is correctly connected with the snap and lock feature. The design looks sleek on the counter, and it feels good not throwing hundreds of bottles and cans into the landfill. In moments I make all the sparkling water I need without leaving home. It would be fantastic if the unit came with an extra bottle so I can keep different flavors in the fridge ready to drink. The only real negative of this model is having to handwash the bottles and the need to order more of them. Neither of these issues is a deal-breaker. Customers leave great reviews for this model and find they drink more water after purchasing the One Touch. I recommend buying the electric SodaStream One Touch for the cool look and ease of use. I love knowing I can save money, help the environment and make refreshing sparkling water in moments, and you will love it too. I like the electric version of the SodaStream so much better. All you have to do is select the level of carbonation you want and push the corresponding button. Unlike some machines, you do not have to screw the bottle in place. The mechanism grabs and locks the bottle in place simply every time. The One Touch also comes with a 2-year warranty. The SodaStream really is a quality product. Since I do not drink much soda, I was reluctant to have anything to do with a soda maker. But, I got into drinking sparkling water after visiting a friend who enjoys the added touch. I grew to like it too and switched to sparkling water. However, the habit can become quite expensive. I watched an advertisement for the One Touch and thought I would try it out. I am glad I did. It is so easy to use. Just add cold water to the bottle up to the fill line. Attach it to the SodaStream and push one of the three carbination buttons to get the level of carbonation you prefer. The machine makes a great alternative to buying sparkling water or soda, as it saves you money. Add a slice of fresh fruit or a few drops of flavoring drops and you instantly have a great beverage at a reduced cost. We were upset when our SodaStream died after three months after the lights began flashing during use and would only reset if we unplugged the machine, but it just kept happening. I now have read other reviews with the same issue, so it must be defective electronics. I do not recommend this power model, we had to send the unit out for repairs. Just started using my electric Sodastream yesterday. The unit seems to be great. I tried the diet cola flavoring, it is vile . Don’t waste your money. I tried the diet gingerly today and it was tolerable at best. If you wanted to replace buying soda, it may not be for you . The sparkling water is superb !